As part of this perfected society, our musician protagonist Mira A should be happy. 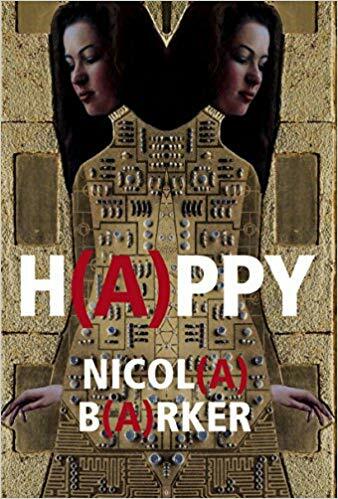 But instead, she is “h(A)ppy.” “Why? Why does the A persist on disambiguating? On parenthesising?”, Mira A asks. The glitching of this word is our first clue that she is not fully synonymous with the system. She has a “kink.” This glitching intensifies as the novel progresses, paralleled by a movement from standard narrative form to wild typographic showcases, until the whole thing explodes. True, this tightly controlled dystopian future and a protagonist who screams rebellion resonates with several sci-fi narratives – from Orwell’s 1984 to Charlie Brooker’s Black Mirror. However, H(a)ppy severs these ties fairly quickly. Its boldness allows the novel to smash its own path into unknown territories of genre and form. Barker uses a kaleidoscope of font colours and sizes; pages of text which repeat a single sentence; embedded symbols; mathematical equations; bars of music; sentences which spiral down the page to create pattern and image. . .the list goes on. She takes us on an erratic journey, which explores words and all they hold – danger, emotion, power and duplicity. The myriad of forms, narratives, and typographical experimentation Barker employs result in a novel which is undeniably engaging, innovative – and often difficult to follow. It is chaotic. It is confusing. It is difficult to quote or analyse. It is open to wildly subjective interpretation. 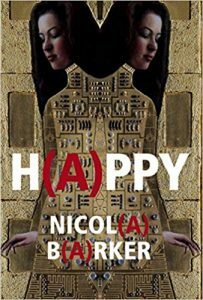 It is a novel which Barker herself admits, “gets nuts.” Which is perhaps quite brilliant considering H(a)ppy is, ultimately, a satire of the crazy age of information we are living within.